The Nano Soft Salt Free Softener / Conditioner offered by Pure Water Solutions is the lowest priced and has the best warranty of any available salt free water softener certified to be effective. Traditional water softeners that use salt can leave your water feeling slimy. But with the Nano Soft salt-free water softener your water will only feel clean. The Nano Soft removes scale build up with the need for salt, electricity, or chemicals. Less scale in your water means cleaner clothes, no harmful deposits in appliances, using less laundry detergent. You can count on the Nano Soft salt-free water softener to continuously remove scale build-up from your water heater tank and water pipes, yet maintain the beneficial minerals in your water. To make the installation process as simple as possible, Pure Water Solutions is a licensed Oregon contractor based in Rogue River. 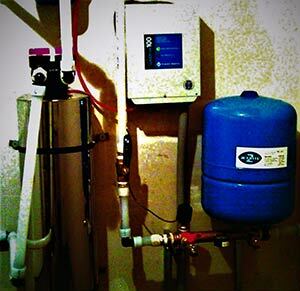 We provide complete install water softener packages. Over the years, Pure Water has installed hundreds of systems in Grants Pass and Southern Oregon using properly licensed contractors and sub-contractors for all our work. In Grants Pass, Pure Water Solutions can provide you with a trouble free Salt Free water softening system giving your family safe purified well water for years to come.